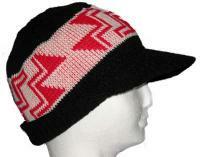 Native American Design featured on a Bill / Visor Style Beanie for Adults, Teens, children and babies ~ Men and Women alike enjoy our special visor beanies. 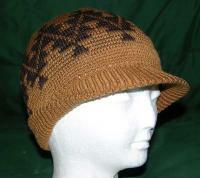 This cap is offered in our finest Merino Wool or Acrylic Yarn. 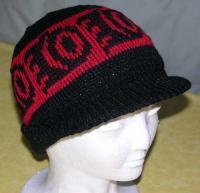 This is a Unique, Quality, Hand Loomed Knit Cap with Visor / Bill . It is totally 'full fashioned' - this means it is not a 'cut n sew' product! 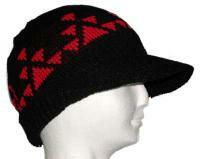 The Visor is encased in a knit rib that has lycra added to the rib fiber. The lycra makes a nice firm fit on the head and allows for the 'stretch' so the hat will fit most head sizes from child to adult. Notice how the ribbing can be folded up if you want it to fit closer to the head and above the ears, or fold the rib down to cover the ears for warmth. 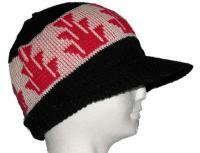 The top ribbing creates the close fit on the top of the head.